Take the meat out of cold storage and let it rest at room temperature one hour before you begin cooking. Trim any excess fat and cut into four equal 10 oz. pieces. Coat generously with fresh ground pepper. And, be sure to get both sides! Begin to bring a large pan of water wish a splash of olive oil up to a boil. Add the pasta, stirring regularly, so it does not stick. Cook the pasta al dente, drain well, and set aside. Add a bit of olive oil to a large pan and bring it up to high heat. Sear the filet about three minutes on each sides over high heat. Remove from the pan to rest. The steaks will be very rare in the center still at this point. Add a bit more olive oil to the pan and sauté the garlic and onion on high heat, about three minutes, until nice and fragrant. Remove from the pan into a dish. Keep the pan on high heat. Add the red wine to deglaze the pan. The wine will cook off very quickly. Scrape the pan with a wooden spoon free all the good flavor of the steak. When reduced by half, add the dry chicken base, cream, butter, and incorporate the cheese, stirring constantly. When the cheese has fully melted into the sauce, return the onions and garlic to the sauce. Continue to stir regularly. When the sauce starts to bubble again, reduce to low heat. Cut each filet into four equal pieces. Add them back into the pan. They will require only about two to five minutes in the pan to finish cooking, depending on how well you want the meat. Remove one of the tips from the pan and cut to check if it is done. Ideally, serve medium rare…the tips will be pink in the middle. This is a premium dish with expensive steak. Use good quality Cabernet for your sauce. The flavors of the wine will come through in your final dish, just as if you were drinking the wine from the glass. Use good quality smoked gouda. The cheese should be firm. Avoid using processed gouda if possible or you may get clumps in your sauce. Turn off the heat when the meat is still slightly undercooked. Remember, it will continue to cook in the warm sauce, even as you are adding to the plates delivering it to the table. 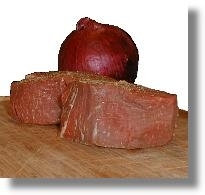 Be very careful with this dish not to overcook the delicate filet. To serve, add a handful of pasta to warm, oversized plates or pasta dishes. Add four of the filet mignon tips on top, and finish with a scoop of the sauce. Sprinkle a bit of shredded smoked gouda over the top. Serve immediately with fresh, warm bread! For wine, pair the dish with the remainder of your open bottle of Cabernet Sauvignon. You may need a second bottle!